click on the photo to download the high resolution version. Ron Samworth Vancouver-based guitarist/composer Ron Samworth is known on the Canadian improvised/contemporary music scene as an inventive textural improviser and a strong fluid melodicist informed and inspired by a variety of music traditions including jazz, rock, new music and traditional music of many cultures. He leads the acclaimed Vancouver-based quartet Talking Pictures and co-directed the NOW Orchestra for ten years and the indie rock bands Darkblueworld and the Luscious. He is also a member of the Peggy Lee Band and the Hard Rubber Orchestra. His has performed and recorded with numerous international artists including John Zorn, George Lewis, Evan Parker, Fred Frith, Han Bennink, Dave Douglas, Robin Holcomb and Wayne Horvitz. He has appeared at all the major Jazz Festivals across Canada, the Festival International de Musique Actuelle de Victoriaville, at New York’s Knitting Factory, and the New York Improvisation Festival, New Music America, Vienna’s “Let’s Cool One” Chamber Jazz Festival, Chicago and Berlin jazz festivals and other leading venues in Europe. His inter-disciplinary work includes composition, performance and sound design for theatre, spoken word, film, and dance. Lan Tung’s music often experiments with contradictions by taking culturally specific materials outside their context. Her works embody the rhythmic intricacy from Indian influence, the sense of breath/space from Chinese tradition, and her experiences of interpreting contemporary compositions. Lan’s compositions are released on numerous CDs, winning an Independent Music Awards and nominations by JUNO, Canadian Folk Music, and Western Canadian Music Awards. Lan is the artistic director of Sound of Dragon Music Festival, Orchid Ensemble, and Proliferasian and performs with various projects. Originally from Taiwan, she has studied graphic score with Barry Guy, improvisation with Mary Oliver, Hindustani music with Kala Ramnath, and Uyghur music with Abdukerim Osman, in addition to her studies of Chinese music since a young age. Lan has appeared as a soloist with Vancouver Symphony Orchestra, Orchestre Metropolitain (Montreal), Symphony Nova Scotia, Upstream Ensemble (Halifax), Atlas Ensemble (Amsterdam & Helsinki), Little Giant Chinese Chamber Orchestra (Taipei), and Vancouver Inter-Cultural Orchestra. 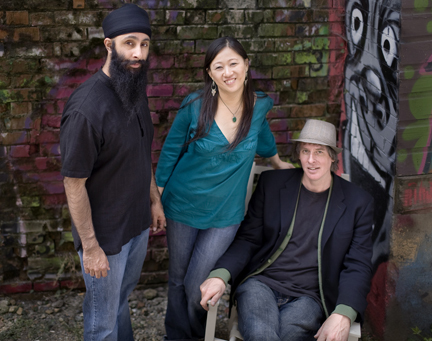 Birds of Paradox was formed in 2007 to explore the fusion of composition and improvisation, incorporating three very distinct voices and cultural backgrounds into a creative whole. Guitarist Ron Samworth is an inventive textural improviser and a strong fluid melodicist, informed and inspired by a variety of music traditions including jazz, rock, new music and folk music of many cultures. Lan Tung creates new vocabularies on the erhu/Chinese 2-string violin, drawing inspiration from her background in Chinese music and various other genres: from creative improvisation, western contemporary music to various ethnic styles, such as Indian, Flamenco and Middle Eastern. Neelamjit Dhillon is equally versed as a tabla player in Hindustani classical music and as a jazz musician on the saxophone. Its debut CD Birds of Paradox has been nominated for Western Canadian Music Award and Independent Music Awards. International multi-instrumentalist performer-composer Neelamjit Dhillon is a professional musician equally versed in both Eastern and Western traditions. His extensive training in both jazz and classical Indian music gives him a firm rooting in two distinct styles and provides a unique perspective into the universality of music. He has obtained a Bachelor of Music degree in Jazz Studies (majoring in saxophone performance) from Capilano University and has also completed a Bachelor of Education degree in Secondary Music Education from the University of British Columbia. He has obtained a Masters in tabla performance from the California Institute of the Arts [CalArts] has just completed his doctorate at CalArts.His latest album Komagata Maru, brings together his diverse musical background to mark the centenary of the Komagata Maru Incident of 1914 in which Indian nationals were barred from Canada and how that event still resonates today. Neelamjit has performed at prestigious festivals and events in locals such as Somaila, Brasil, Canada, India, and the United States.